Diffuses essential oils for aromatherapy applications Safe, heat-free ultrasonic operation produces cool mist vapour Tranquil LED lighting effects Ultrasonic diffusion is an easier, safer way to enjoy the health benefits of aromatherapy and the fragrances of your favourite essential oils. The technology produces a fine, cool mist that disperses into the air to spread essential oil molecules throughout a room. With no open flame, there’s no fire hazard, and the lack of heat also helps to preserve the natural therapeutic properties of the essential oils. 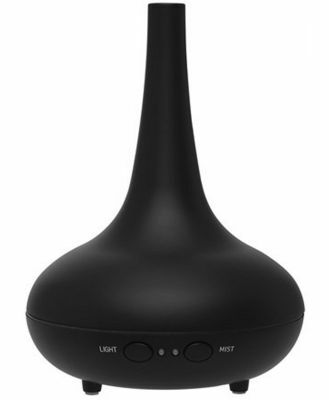 The Tranquil Mist Diffuser provides four or five hours of continuous mist – up to seven hours on intermittent mode – and shuts off automatically when it’s empty. It also features two LED lighting modes that display cool, calming colours and can be activated independently of oil diffusion. To use it, just add a few drops of essential oil(s) to up to 100 mL of water in the reservoir. Clean up is easy, too.